This is a follow-up on the case of the eight reporters being assaulted while covering an apparent traffic accident in Guangzhou (see Comment 200609#019), which is repeated here to make this a complete story. 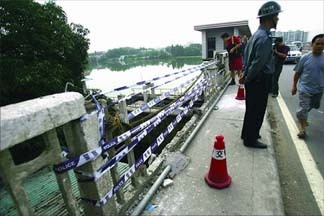 Yesterday, in the Baiyuan district of Guangzhou, a vehicle jumped over the barrier on a bridge and fell into the river. When eight reporters from four different media outlets arrived, they were accosted by men dressed in plainclothes or security uniforms, and roughed up. 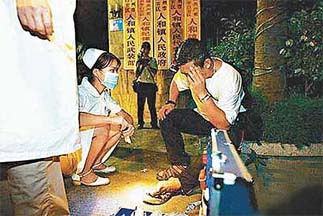 Afterwards, the attackers were seen to walk into the Renhuo town government office building. So what happened afterwards? The newspapers shared their photographs and interviewed each other's reporters. Here is the front page story from Southern Metropolis Daily which quotes the individual reproters. YCWB reporter: I was called to cover this suddenly breaking incident, and I did not expect to encounter this situation. Apart from anger, shock and depression, I also feel helpless. Even today, some people think that they can shut everything down and that force is the solution for problems. That is very naive. Southern TV reporter: When I was dragged from the dam into the dark room, I was afraid because I did not know what was going to happen. Three or them grabbed my arms and another wrapped me up with his arms. I could not see anything inside the room. Several people pinned me against the wall while another tugged at the equipment. I asked, "I won't film then" but they still wanted to seize it. I thought that I had to protect the eqiupment and preserve the evidence, so that everybody can see their ugly performance. New Express reporter: This was obviousl a malaciously organized assault on reporters. Throughout the entire incident, none of the reporters did anything wrong. But I don't know who was directing these steel-pipe-wielding men wearing steel helmets to attack unarmed reporters. 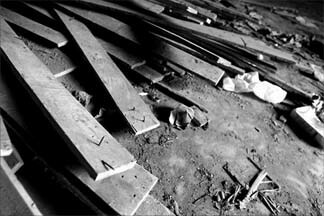 Southern Metropolis Daily reporter: After being taken into the dark room, someone seized the camera of our photographer and dropped it on the ground. Then someone else tossed the camera out the door. We went up to retrieve it but they pushed and punched us. We slowly backed up out of the room. In the confusion, our photographer stepped on a nail and started beldding. 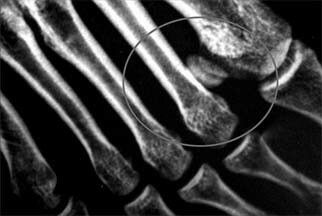 (Photograph of nail on board and the x-ray of the foot is shown below). In the evening, the Southern Metropolis Daily reporter contacted Renhuo town party publicity committee member Chen (who is a deputy town mayor) who said: "According to my understanding, our security people did not assault anyone. There is no doubt about that." When the reporter asked him about his view on the attack on the reporters, he said: "You people claimed that there was an incident. I do not accept that it happened." (Youth Weekly via ChineseNewsNet) By Ma Jun (馬軍). October 6, 2006. At 2am on September 25, a car National Route 106 lost control when it reached the River Dam Bridge in Renhuo town, Beiyun district, Guangzhou city. 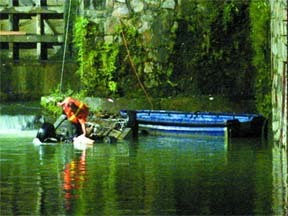 The car crashed through a barrier and plunged into the river. Afterwards, eight reporters from Yangcheng Wanbao, Southern Metropolis Daily, New Express and Southern TV were attacked by several men wearing security uniforms, and one reporter stepped on a nail which went through his foot. Who assaulted the reporters? The local town government and the reporters told different stories. The investigative report from the Beiyun district government has been rejected by the Guangzhou city government, which has formed a joint investigation team from the city government political consultative committee to re-investigate the case. New Express reporter Baichuan told us: "There are so many ridiculous and suspicious things in this case." When the investigation results come out, they intend to dig further. Southern Metropolis Daily reporter Zhou Jiong said that he has received a tip that this seemingly ordinary car involved in the accident was carrying several hundred thousand RMB which has not been been recovered yet. I received a tip at 2am. I was roused from my sleep and I rushed over in a taxi. I arrived at the scene at 3:58am, about the same time as several other reporters. At the time, we were underneath the bridge outside of the secured area. More than 10 security guards carme at us from either inside the secured zone or down from the bridge above. They came at us and assaulted us physically There were joined by some plainclothesmen later. To be able to convene so many security guards and plainclothesmen told us that this was an organized malicious attack on the reporters. First, a lot of people showed up all of a sudden; second, these people came from the secured zone, which is closed to ordinary citizens; third, after they came down, they went through the bridge gate in order to approach us. Ordinarily, this gate is locked and ordinary people cannot enter or exit. So was it organized or what? When so many security guards and plainclothesmen were assaulting the reporters, how could the commander at the scene not know? If this was not organized, then could these people be coming over to assault the reporters on their own? As soon as we were attacked, we began to call the police. Every one of us was calling the police. I made nine calls myself. Of the other seven people, everybody except for the one person who did not have a mobile phone was caling 110. But for one whole hour afterwards, we did not catch the sight of any police. Finally, at 5:20am, two police officers came to take us to down to the police station for note-taking. Because there were too many of us to fit into the police jeep, we squeezed inside the Southern Metropolis Daily news vehicle and we followed them to the police station. But this police car managed to lose us. For half an hour, we went around the neighborhood and we even called 114 for directions. Finally, we found the police station at 6:50am. This is suburban Guangzhou which none of us was familiar with. But is it possible for the police to lose people who want to file a police report? This is so ridiculous that I didn't even want to bring this up. We followed from behind and in less than 500 meters, the police car vanished. There were not a lot of cars on the road at the time. I don't know for sure whether our driver failed to follow or the police dropped us. But even if we drove too slowly, can't they wait for us? Did the police car not have a rearview mirror? Even if they lost us, couldn't they call us? When we called the police, we all left our telephone numbers. But throughout the entire process, nobody called us. When we arrived at the police station, a leader told us to settle this privately. What is a private settlement? It means no reporting. At the time, the police station leader advised the reporters: "Don't report this. Don't magnify the incident." So I asked him right there and then: "Are you saying this in the name of the police or in your own private capacity?" He said that this was in his own name and he only wanted to exchange viewpoints with us. I said, "This is not up to the reporters to say so." Then I talked tough: "If we wanted to report on this, not even Guangdong province committee party secretary Zhang Dejiang can stop us." This was because we had been abused badly. If the reporters had been inside the secured zone, we probably won't have a leg to stand on and they might have the goods on us. Why did so many people appear and then head straight for us? Why did no police show up for one hour after we called them? At the time, we were outside the main gate of the town government. When the ambulance came and the medical team tended to the reporters, one person from the town government courtyard ordered the doctors not to give medical aid to the reporters. "Don't tend to the their wounds!" What kind of mindset is this? When we charged over, he ran away. There were three other people at the scene. 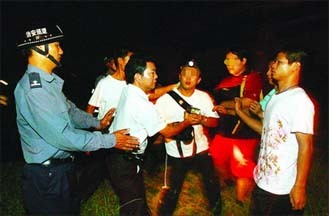 When the reporters were being assaulted, they went to ask the town government office for help but they were kicked out. Why is that? Don't you feel that those people are brutal? If there weren't eight reporters that night and I was the only reporter in the darkness under the bridge, what would happen? I cannot imagine. Would they grab me and throw me down the deep drainpipe? Hard to tell. I wanted to find an excuse on behalf of the other side just to make me feel better, but I can't find any. Why did they choose such a special way of handling the matter? I thought this was strange. Would an ordinary traffic incident lead to an assault on eight reports from four media outlets? After the attack, we could not figure out any reason. In all the incidents of attacks on reporters around the country, the main reason was always that the other side was afraid that the reporters might uncover some truth. Why else would they attack the reporters? More than twenty days earlier on September 2, a similar incident occurred at the same location in the same way. A car fell into the river. This bridge is relatively old. Since a traffic accident occurred here, the local government should responsibly place a warning sign at the scene and set up road barriers. If that had happened, the latest incident need not have occurred. Besides, this bridge severely limits traffic on National Route 105 and has been targeted for expansion by the government. Why hasn't construction begun? This may imply lack of action on the part of the government. Are there even deeper reasons or reasons that we don't know yet that caused them to want to bottle up the information? When the results of the investigation come out, we will still want to go and dig out the truth. Through this event, I feel that even a good investigative reporter will only find out very little. No matter how good you are, you can only get to a corner of the iceberg. In this incident, we reporters who were assaulted were totally innocent. In this affair, you must recognize one point: the area of reporter activity was totally outside the secured zone. That is to say, we were going about our normal work as reporters and they have no right to evict or attack the reporters. At first, we contacted the Renhuo town police station. 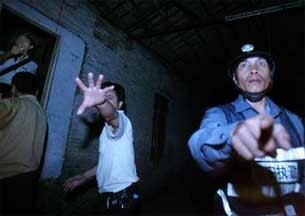 Then the Baiyun district police station conducted an investigation. Then it was the city public security bureau that joined the investigation. Now it is the Guangzhou city political consultative committee that has formed a joint investigative team. The gradual escalation came as a result of the pressure from the media. Before the city political consultative committee began its investigation, the Baiyun district had presented its preliminary investigative results. That investigation was unfavorable to the reporters because it said that they did not attack the reporters. But when Baiyun district showed the report to the city and provincial leaders, the latter ordered a re-investigation. The photographs taken at the scene had been published in Southern Daily, Southern Metropolis Daily, New Express and other media. The video from the scene contained the words "Beat!" clearly. These photographs were taken by our photojournalists at risk to their lives. One reporter's camera which is worth several tens of thosuands of RMB was damaged. They said that the reporters were not seriously injured. Do they need a dead reporter before they will take action? They are doing everything to seal this up. But how can it be sealed up? It has almost been one week, and the joint investigative team has said nothing. We are patiently waiting. We will wait until we get a response, and then we will report again. Q: Is there any new development in the case of the assault on eight reporters? A: The 9.25 incident Guangzhou City Committee Joint Investigative Team is comprised of members from the Political and Legal Consultative Committee, Department of Publicity and the City Public Security Bureau. Yesterday (September 30), they called me to verify a small detail in the incident. They said that a preliminary conclusion cannot be reached until after National Day. They are investigating two matters. One is about the original matter of the reporters being assaulted. The other is about why the police arrived more than an hour after they were called. Right now, there is no explanation for either case. I feel that it will be a long wait for the explanations. Q: Why? According to the photographs and reports from your media outlets, isn't this is an obvious matter? A: They don't think it is clear. Actually, about the matter about the police showing up an hour later -- it might be understandable if they didn't want to investigate thoroughly. After all, we do not have any direct evidence in our hands. That is to say, the belated arrival of the police required more evidence because we do not have the entire record of the police dispatch. But on the matter about the assault on the reporters, the evidence is so direct. We have the complete chain of evidence and there should be no doubt whatsoever. What can we do if they still want to investigate? Right now, there is a ban in Guangzhou city against further reporting on this case. We don't have any options, but CCTV is reporting on it. Q: My understanding is that one hour after you called the police, the police directed your news vehicle to the police station for note-taking. Yet the police lost you on the way. Do you find this bizarre? A: This is not the most important thing. People may have different views about it. Of course, one may say that it was deliberate. The police car was leading the way. We followed them and suddenly they were gone. You can ask them and they will say that you lost them. But our driver said that he was following closely and they deliberately lost us. This is hard to say. You can't confront them and you can't prove anything. On these unprovable matters, I personally think that there is no need to tussle with them. Q: You were one of the assaulted reporters. In retrospect, how did it feel at the time? A: Because I have encountered a great deal of obstruction during my reporting work, I was not particularly scared at the time. At first, we found this to be unthinkable because there is no direct connection to the government and so why should government workers directly command them to assault the reporters? I think that this is more bizarre. I have communicated with them in private. They said that the relevant departments were handling matters at the scene and the security guards were keeping guard in the perimeter. Then some leader on the bridge saw the reporters at the bottom, and he commanded those people to clear the scene. During the execution of the order, the workers may have created some problems. At Southern Metropolis Daily, we have continued to receive tips from the locals, including the identities of the leaders. We know all that, even though we did not report it. One of them is a cadre with the town armed forces, and the other is a cadre with the town government office. Those two were the leaders. Q: Wasn't this just a simple car accident? So why was there a serious incident involving an assault on reporters? I feel that this is suspicious. A: You're not the only one who doesn't understand, because we are also perplexed. This is what it looks like on the surface, but I don't know what they were actually trying to do. For example, we were wondering whether this was because the Renhuo town government had a bad relationship with the media. Could this be the case? But nobody is willing to talk about this topic as yet. A: I just received a tip yesterday. An insider told me that the four people involved in the car accident had just received several hundred thousand RMB and were ready to return to Huadu. After the vehicle and the bodies were retrieved, the money was missing. Q: Is the information from this source accurate? A: It is relatively accurate. Since the source is in a special position, he should have access to the situation. But this is a single source. We would need to take more steps to verify it. But even this information does not explain to me why they needed to stop the reporters so urgently. Furthermore, we are also suspicious as to why the town government needed to send so many people over such a matter? We spoke briefly with the families of the individuals in the car, and we cannot show that there was anything exceptional about this car accident. I can only say that this occurred relatively close in time to the previous accident. When the car accident occurred on September 2, the media criticized them for not offering assistance in a timely matter as well as having problems with the bridge. But the bridge is not under their jurisdiction. It is the responsibility of the highway department. We want to know if someone behind the scene is responsible. In addition, we want to know why this occurred. The second question is premised upon the government admitting that it was a fact that reporters were assaulted. But so far, the government investigators are holding an ambiguous and ambivalent attitude. If they won't even acknowledge that the reporters were assaulted, then we can forget about anything else after that. The good thing is that the evidence for the case is very clear. Q: Can you say that it is ironclad proof? Q: Of course, it is ironclad proof. Not just the images, but the sounds of people crying out 'Beat him' and 'Hit him' were recorded. We have verified that these people are from the town government office.